I always daydream about taking overnight trips on my old Honda. The feeling of freedom, the drone of the engine as it flies through twists and hills. I had never taken a trip longer than 150 miles, leaving home in the morning and getting home in the evening. I had been riding long enough and had enough mechanical knowledge that it was time to ride farther from home. A lot of modern bike riders probably laugh at my cowardly attitude towards leaving town, but if something goes wrong, or I need a part, it could take up to a week to get it shipped and replaced. I would be checking my oil level at every stop, and I would ride within the limits of the bike. Not stopped by the anxieties of breaking down, I started to plan out a route. I live off the 91 Freeway in Fullerton, and wanted to get to the coast as quickly as possible, so my route was simple, take the 91 West to Pacific Coast Highway, and make my way up to Santa Barbara! The day I left, I woke up full of anticipation. My bike was all prepped for the trip with fresh oil, spark plugs, lubed up cables, etc. I was confident in my old machine and I was confident that my blanket and tent weren't going to come undone on the way there. I set out at a nice brisk pace and the Honda performed just as it should. It felt so good to be riding solo, just me, my gear, and my bike. The weather was great, probably 70 degrees when I reached the coast. I stopped for fuel and food in Santa Monica. 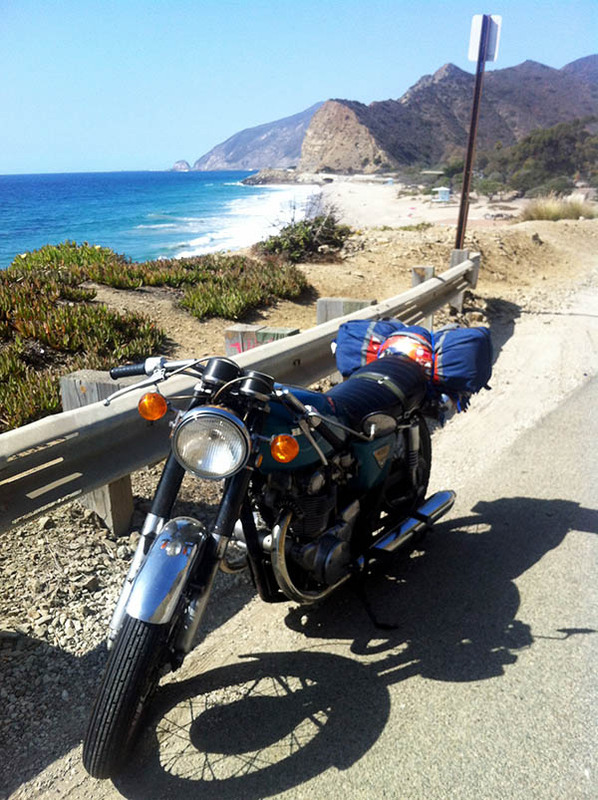 There were plenty of motorcycles on PCH; choppers, sport bikes, bobbers, a few vintage British bikes. After a quick Red Bull with my tank full, I kicked my machine to life, gave the friendly nod to the other riders and happily pulled back onto the highway. 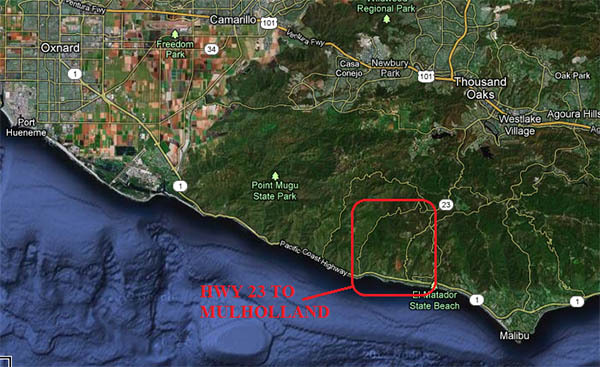 There are a couple really great twisty canyon roads off PCH in between Santa Monica and Oxnard. A great little road out there is Highway 23. Take that off PCH and have some fun scraping your pegs on those turns. That road ends up hitting Mulholland highway, and you can actually take that back to PCH. It was a great little offshoot, but I still had quite a few miles to go. Riding along Highway 1 between Malibu and Oxnard is one of the most relaxing and beautiful experiences a human being can have. As you continue north away from the pollution of Los Angeles, the water turns a brighter shade of blue. There are plenty of places to stop and enjoy the views and take a break from your bike's vibrations. After topping off gas and oil in Oxnard, I motored up the 101 at highway speeds up to Santa Barbara. 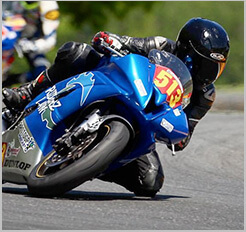 I was very happy with how my bike performed in the 65-75mph range. Santa Barbara came too fast, but I was ready for a little food and drink. It took me about 5 hours with stops to make it up there. I was able to get a campsite at El Capitan State Beach, where I drank a couple beers and fell asleep early. The next morning, I looked over the bike again, making sure it was ready for the journey back. I changed out the spark plug on the left cylinder; there was a little too much carbon build up for me to be happy. The trip home was fast and beautiful. Getting back to the smog of the LA basin, I immediately started daydreaming about my next trip. Maybe next time I'll just keep going north!